After the US Supreme Court’s 1987 decision forbidding the teaching of creationism in science classes, those who objected to the teaching of evolution modified their ideas slightly. They relabeled these ideas “Intelligent Design.” In the wake of that tactic’s defeat in the courts, the opponents of science education retooled again. This time, they targeted a number of state legislatures with two categories of bills that shared nearly identical wording. This tactic saw success in Louisiana, although a number of similar bills were considered in other states. They’ve now achieved their second success — the passage of a law in Tennessee. The state’s governor, saying the bill doesn’t “bring clarity,” has decided not to sign it. But he’s decided not to veto it either, which will allow it to become law. Next up for discussion - Stork Theory vs Sexual Reproduction? This law turns the clock back nearly 100 years here in the seemingly unprogressive South and is simply embarrassing. 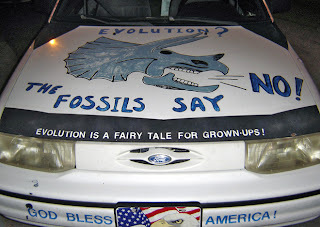 There is no argument against the Theory of Evolution other than that of religious doctrine. The Monkey Law only opens the door for fanatic Christianity to creep its way back into our classrooms. You can see my visual response as a Tennessean to this absurd law on my artist’s blog at http://dregstudiosart.blogspot.com/2012/04/pulpit-in-classroom-biblical-agenda-in.html with some evolutionary art and a little bit of simple logic. "Next up for discussion - Stork Theory vs Sexual Reproduction?" That's just about the most pithy comparison I've ever heard. Love your blog. To gain the mandatory financial education, it's best to obtain association along with, Cheap Jordans,access to, in addition to membership in a wealth creation community. Consequently, you will learn and have the information to use choice wealth creating strategies such as Financial institution on Yourself, debt reduction, and asset trade protection. You will come in contact with wealth acceleration investments in areas (outlined in this along with previous blog blogposts) such as a different access to area, 3D virtual engineering science, atomically precise creation, nuclear power propagation, commercial space projects, Carrier Ethernet engineering, nanotech lithography, robotics, nano-based next-generation assault and battery technology, precious alloys, water rights, gas, natural gas, caustic potash mines, food products, and gold mines. You'll have the knowledge to take into consideration investments in possessions that are naturally useful like oil colour rigs, Cheap Jordan Shoes,hydropower, or perhaps methanol plants; items that are hard to build, difficult to change, and costly to help substitute; definitely definitely not financial stocks, not retail stocks, retro jordans for sale,definitely not commercial property. I m delighted to read your post,supreme court has been taken a good decision.Thanks for disclosing the nice post.